FILE - Selfie picture shows Swiss pioneer Bertrand Piccard during the last leg of the round the world trip with Solar Impulse 2 over the Arab peninsula, July 25, 2016. 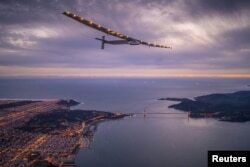 Two visionary adventurers who piloted Solar Impusle 2, the first plane powered completely by the sun around the world, said clean renewable technology can stop climate change by reducing global warming. Solar Impulse pilots, Bertrand Piccard and Andre Borschberg took turns flying solo on their pioneering 23-day journey around the world in the first completely solar-powered airplane. In a meeting with journalists in Geneva, Piccard was visibly exasperated when asked what he and his colleague were planning to do now that they were "grounded." "It means that what you have done has no value. It is done. It is forgotten. Now continue. What is next? It is very frustrating." Recovering from his temporary irritation, the normally amiable Piccard said that he and Borschberg would be working to promote renewable energy under the organizational umbrella of the World Alliance for Clean technologies to bring all the actors of the clean technology world together. "The aim of this project, how I conceived it when I initiated it, was not just to have a plane flying around the world, but to have a tool to demonstrate what clean technologies can do and to promote these clean technologies to be implemented everywhere. "For this, of course, we needed the most extraordinary plane ever built," he said. FILE - "Solar Impulse 2," a solar-powered plane piloted by Bertrand Piccard of Switzerland, flies over the Golden Gate bridge in San Francisco, California, U.S. April 23, 2016, before landing on Moffett Airfield following a 62-hour flight from Hawaii. And, extraordinary it is. Solar Impulse, which was organized and built by Andre Borschberg, has a wingspan wider than a Boeing 747, is no heavier than a car, and carries more than 17,000 solar cells. Stepping into the cockpit is to enter the world of the popular TV character Dr. WHO. Wonderful adventures begin after Dr. WHO and his female sidekick enter a public telephone booth. Great experiences also lay ahead for the Solar Power pilots when they entered their telephone booth-sized cockpit. The cockpit contains a toilet, the controls and nothing else. During their separate solo flights over their 23-day journey, the pilots had to wear oxygen tanks to breathe at high altitude and were permitted to sleep for only 20 minutes at a time. 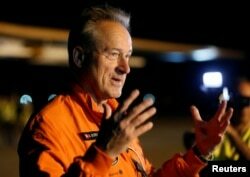 "We had time for dreams," said Borschberg. "For me, it was the time to reflect, the time to take notes, the time to look outside, the time to think, the time to appreciate. "I think we both felt it was a fantastic privilege to be in this airplane," he said. When you are in the middle of the ocean, he said "you look at the sun and you just see the sun rays coming down. They hit the wing. It gives you enough energy to keep going day or night. "When you see this," he said, "you understand that this technology is truly fantastic." FILE - Swiss aviator of the solar-powered plane Solar Impulse 2 Andre Borschberg speaks with journalists before taking off at San Pablo airport in Seville, southern Spain, July 11, 2016. Borschberg said when he and Piccard began working on Solar Impulse 13 years ago, electric propulsion was not considered feasible in the aviation world. "Today NASA is developing an electric aircraft. Airbus is developing an electric aircraft. So it is starting to be on the roadmap of the aviation world. I think that for us it is something, which is…very, very good news." He said he and Piccard also were working on an unmanned version of Solar Impulse, which could stay in the stratosphere for many months. "You could have something which is persistent, which could stay three months in the stratosphere. For example, 20 kilometers altitude — completely sustainable and the sun is the only source of energy." He said the unmanned plane would be able to provide communications, observations, measurements — partly done by satellites and other type of low-flying aircraft. "So, we are evaluating the benefits of such a technology." Bertrand Piccard told VOA clean technologies are the solution to global warming, which is causing sea levels to rise, increased flooding, more destructive hurricanes and other extreme weather. "The solutions today that can really bring together the world of industry and the world of ecology is the clean technology world. With the clean technologies, you divide by two the CO2 emissions without touching the lifestyle of the people." Piccard said clean technologies will allow people to live in houses that do not consume energy. He said electric cars are 10 times more efficient than gas-driven cars. Long-lasting light bulbs and many other energy efficient innovations are possible today. He said putting a positive spin on the new technologies is the way to solve global warming. "You will not solve global warming by asking people to leave their car at home and go by foot. It will not work," he said.